Drill for oil and match 3 cards to win the jackpot. Become an oil tycoon in scratch oil mania as you uncover the cards to find the best oil fields to earn you a buck. This cartoony animated is a slick and entertaining card turner for any new online gamblers. NextGen Gaming has evolved a lot during their 20 years on the market, always delivering innovative and creative products. They have become one of the leading developers in online casino games. They know how to deliver engaging entertainment products and have proven themselves very popular amongst their players with a large list of different themed games to choose from. The energetic development team provides always new gameplay experiences to their audience. NextGen Gaming brings revolutionary ideas to their games pleasing a wide range of players. Scratch Oil Mania is an adaption from its original exciting slot game Oil Mania. The aesthetics are the same with its cartoon art style and oil rig silhouettes in the background. The theme continues to be about the black gold and the search for this natural resource that can bring a lot of big fortunes. In this version you play a 3x3 scratch game and try to match 3 identical symbols. You are presented with 4 scratch cards on the screen and a big paytable on top of them. You can place different bets for each scratch card giving some extra excitement to this otherwise very relaxing game making the gameplay experience more engaging. Make part of this exciting hunt for the resource and try to find the massive business tycoon, the dirty oil worker, an exploding oil rig, a red suitcase full of cash, a shiny golden car, some colourful barrels and a boring profit graph. Each of these theme related symbols will give you different payouts as they apply different multipliers to your bet when you get a match of 3 identical items. The lowest value symbol giving you a 1x multiplier are the barrels, the profit graph gives you a 2x multiplier, the red suitcase full of cash grants you a 5x multiplier, the golden car gives you a 10x multiplier, the oil worker rewards you with a 50x multiplier, the exploding oil rig gives you a 100x multiplier and the business tycoon grants you a massive 1000x multiplier. If you want to make part of this search for the black gold and also get your slice of the fortune you have to bet a minimum of 20p or, if you consider yourself somewhat of a high-roller, up to 200 pounds. If you are looking for a nice and relaxing variation of the original slot game this scratch game will give exactly that to you. It still offers you a nice game feel which the slot game also had but in a very relaxing adaption to a different game genre. The business tycoon symbol can be very profitable with its generous multiplier prize. 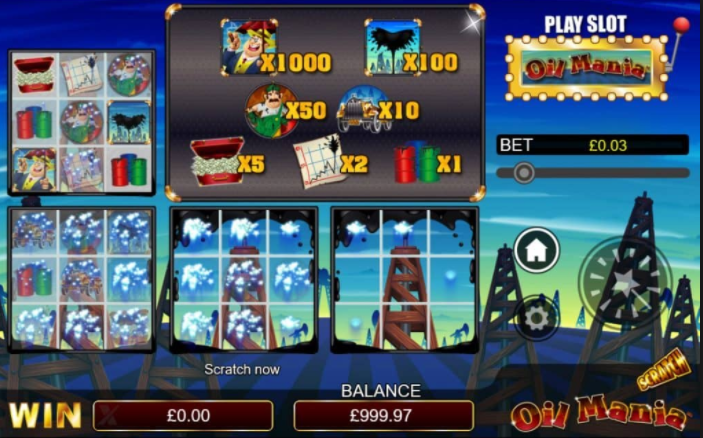 The overall gameplay experience can be enhanced through the different bets for each scratch card that you are presented with in this game. Scratch Oil Mania will deliver you the excitement of working in the adventurous business with the black gold and give you a some of its big fortunes too.